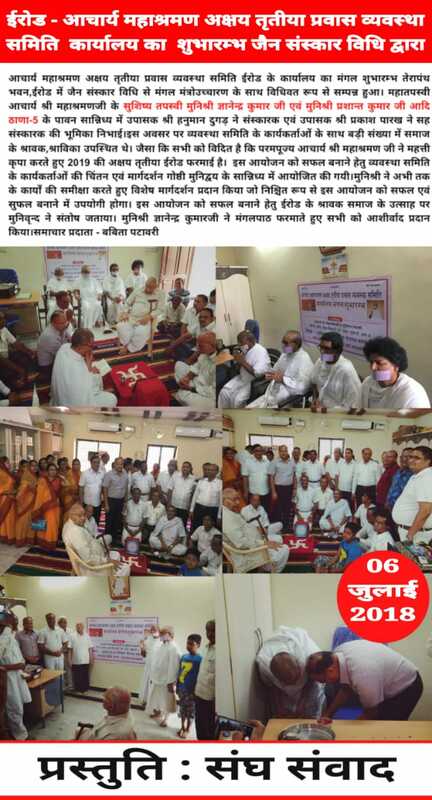 Acharya Mahashraman Akshay Tritiya Vyavasta Samiti was inaugurated in erode by Jain Sanskar Vidhi in the pious presence of Muni Gyanenendra Kumar and Muni Prashant Kumar. Upasak Hanumant Dugar and Prakash Parekh performed the rituals. There was a huge gathering. The upcoming Akshay Tritiya of the year 2019 has been slated to be held in Erode in the presence of Acharya Mahashraman. Various discussions were held regarding the hosting of the event. The event ended with the recite of Mangalpaath by Munu Gyanenendra Kumar.